Vaughn Graham, CPCU, AFSB, CIC is the President of Rich and Cartmill Insurance & Bonds. 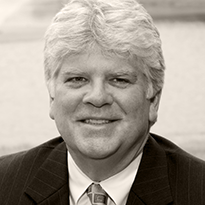 He joined the firm in 2003 through the merger of the insurance agency of which he was a Principal since 1989. His commercial business is focused in areas of construction insurance and bonding, construction related risks, energy, physician and medically related and other types of commercial risks. Vaughn is been a leader in the Oklahoma insurance industry serving the association of Independent Insurance Agents of Oklahoma as it Chairman. He has served as President of the Independent Insurance Agents of Greater Tulsa and as Chairman of the Independent Insurance Young Agents Committee. Vaughn is currently a member of the Executive Committee leadership team of the Independent Insurance Agents and Brokers of America and presently is the Chairman of IIABA. In the Tulsa community, he is a member of Leadership Tulsa; the Rotary Club of Tulsa and is a volunteer mentor to students of Celia Clinton Elementary School. A Tulsa native, Vaughn is a graduate of the University of Oklahoma.